Three astounding works by Elliott Gyger are presented by Halcyon and featuring the thrilling voices of Jenny Duck-Chong and Alison Morgan and some of Australia’s best performers. This is challenging music which rewards every listen. It’s full of mystery and glistening textures and its narrative holds you to the end. giving voice is an intimate exploration of the theme of early childhood setting texts by contemporary Australian female writers. Petit Testament is a setting of the last work of the fictional poet Ern Malley. 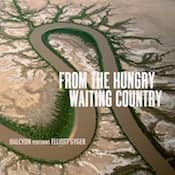 From the hungry waiting country is a complex meditation on a subject dear to most Australians - drought and water shortages. Singers Jenny Duck-Chong and Alison Morgan, aka Halcyon, have been quietly getting on with making tricky and beautiful things for two decades now. For this, their latest CD, they return to the music of Elliott Gyger, a composer, colleague and co-creator who has been with them throughout their journey. It is a potent combination: Gyger juggles words, notes, jokes and observations, meanings and warnings with uncanny skill, creating something at once complex and as clear as still water; Duck-Chong and Morgan take his ideas and make them dance with deceptive ease. In fact, there's so much going on, so much to delight in, to be moved by, that, in spite of its clarity (and a superb recording), it's hard to listen to the whole album in one go. The mood ranges from playful – setting words favoured by Gyger's daughter, aged 20 months – to ominous, in his bleak and unblinking setting of A. D. Hope's Australia. Like the finely crafted poetry Gyger sets to music, each track is a musical poem warranting close listening and contemplation. So now I'm going to go back and re-listen, one track a day, reading the evocative words and basking in a Halcyon daze. For the past 20 years, Halcyon has commissioned and recorded an array of music from composers at the edgy end of the spectrum. Among the Sydney-based ensemble’s recent releases are pieces by Elliott Gyger, who has had a luminous career in Sydney, Boston and, since 2008, at Melbourne University. Hailing from a literary family, Gyger brings an acute sense and understanding of text, its meanings and sonic nuances. These qualities illuminate the works on this album, three of the six he has written for Halcyon. The first work on this intriguing disc, giving voice (2012) emerges as an intimate song cycle on the theme of childhood, and the acquisition of speech as a symbol of emerging identity. In this recording, it is the virtuosic playing of an instrumental quintet which carries the 26-minute work to its somewhat equivocal conclusion. Settings of that notorious spoof poet Ern Malley for two female voices and piano, Petit Testament (2008), meander for nearly 10 minutes. But it is the final work and title track which lifts the spirits. Scored for four female voices with harp accompaniment, the 30-minute piece from 2006 reflects on the devastating effects of climate change on this continent. Hardly surprising for the composer of the acclaimed chamber opera version of David Malouf’s Fly Away Peter (2015), this album presents some of the most virtuosic and uplifting vocal music ever created by an Australian composer.